This fall, the Whitney Museum of American Art is presenting Archibald Motley: Jazz Age Modernist, the first retrospective of this pioneering artist in New York in more than two decades. One of the most important figures associated with the Harlem Renaissance, Motley was a master colorist with a daring sense of spatial invention, and qualities he combined with keen observational skills honed on urban culture. Comprised of forty-two paintings spanning from 1919 to 1963, the exhibition, which prior to its presentation in New York traveled to Fort Worth, Los Angeles and Chicago, is a full-scale survey of Motley’s career and a rare opportunity to see so large a collection of his relatively small surviving body of work. Although the artist worked in Chicago for most of his life, he was inspired by Jazz Age Paris, and, later in his career, visits to Mexico. Motley’s bold use of vibrant, expressionistic color and keen attunement to issues of race, society, and class make him one of the great visual chroniclers of his era. Arranged thematically, with some chronological overlap, the exhibition has six sections, each looking at a particular facet of Motley’s oeuvre. It begins with a selection of the artist’s portraits, a traditional genre he treated with great sophistication, combining his strong understanding of art history with an interest in altering social roles. The artist first achieved recognition for his dignified depictions of African Americans and those of mixed race that challenged numerous contemporary stereotypes of race and gender. In 1929, Motley received a Guggenheim fellowship that allowed him to work for a year in Paris, where he created several lively paintings that vividly capture the pulse and tempo of the city. These canvases, which make up the section “Paris Blues,” depict diverse social worlds in Paris’s meandering streets and jam-packed cabarets. 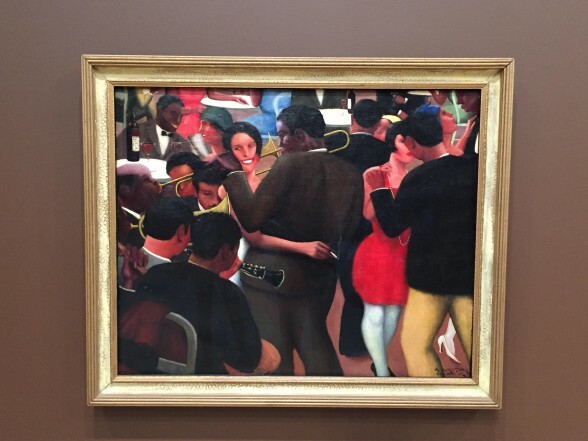 Some of Motley’s greatest works emerged during this period, including Blues (1929), a closely cropped image of couples dancing amid jazz musicians that is among the artist’s masterworks and an icon of the Harlem Renaissance. Upon returning to the United States, Motley built further on the visual rhythm he honed in Paris his scenes of “Bronzeville,” the common contemporary term for the thriving African-American neighborhood on Chicago’s South Side that greatly inspired the artist. His resulting works occupy the fourth section, “Nights in Bronzeville,” and together form a loose series that, taken concurrently, is one of the most significant visual statements on modern urban life in America. Paintings in the following section, “Between Acts,” reflect on leisure activities and societal changes within the African-American community. These urban scenes of dance halls, bars, parks, and playgrounds, at once celebrate the modernity of the Jazz Age, and simultaneously address influx of African-Americans from the South to northern cities as part of the Great Migration. In “Hokum,” the artist’s penchant for outrageous humor and satire comes to the fore, his approach to his subject here sharing much in common with the genre of blues music from which the selection takes its title. The final segment of the exhibition, “Caliente,” gathers works that were inspired by Motley’s travels through Mexico, where he created vivid and often surreal depictions of life and landscapes. The exhibition ends with highly unusual, allegorical paintings: a moving and disturbing meditation on race relations in America. 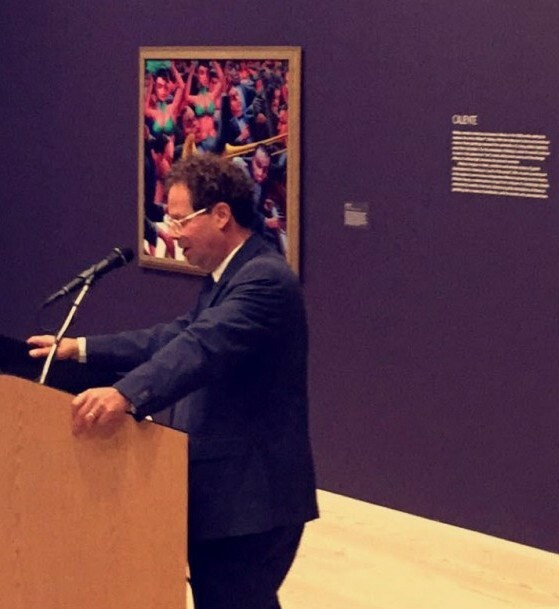 Archibald Motley – organized by the Nasher Museum of Art at Duke University and curated by Richard J. Powell and John Spencer – offers an unprecedented opportunity to carefully examine Motley’s dynamic depictions of modern life, and will be on view from October 2, 2015, through January 17, 2016, in the Museum’s eighth-floor Hurst Family Galleries.